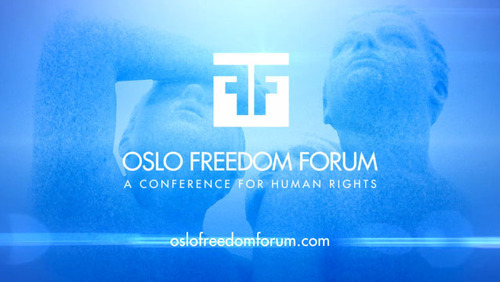 Back in May of this year, Rift Recon CEO Eric Michaud and Lead Trainer Brian O'Shea were poised to present a comprehensive security workshop geared toward protecting high-risk individuals in possession of sensitive information at the 2014 Oslo Freedom Forum (OFF). When a hotel union labor strike unexpectedly occurred, the conference was postponed until October 20-22. This left Rift Recon a few months to reexamine and refurbish their presentation, bringing in skilled reinforcements in the way of notorious author, blogger and journalist Violet Blue. Rift Recon staffer Arianna Travaglini recently got the opportunity to sit down and chat with Blue after she’d returned to the States. She asked Blue about her experience at OFF, the success of her talk, and what it was like working so closely with Rift Recon. Was this your first time at OFF? If so, how was your overall experience? This was my first OFF. I’m so thankful I got to participate, because it centered me as a person, a professional and as a citizen of the world. I’ve never been to a conference where every minute was packed with high value; OFF is the pinnacle of connecting with people who make a difference. It was also very emotional, connecting with people who have suffered and given up their personal freedom so that others can have light on their experience – this, among many other things hit home for me. I got to meet and connect with people doing investigative work in other countries that we’re just not hearing about in the Western world – even though some of them are reporting on atrocities and misdeeds in Western countries. I plan to stay connected to everyone I met (a rarity for me) and further their work wherever I can. I was also relieved to find that so many people shared my views about the OFF experience itself; I had mixed feelings about a couple of things, but I found out I was far from alone in my feelings and observations. Also, I left feeling centered in my purpose, and glad to have stepped very far out of the hacker/activist bubbles to find out where the gaps are between tech’s edges and the needs of people on the ground. People like me, we have much work to do! It’s hard and painful work, but it’s good work. I did walk away with a very deep anger toward people making security products who don’t understand the gravity of the situations their products go into. For so many entrepreneurs, security is almost just a game to them, a Kickstarter they hope gets popular or an app they try to make into a rockstar vehicle. The people I made lifelong friends with at OFF… just one wrongheaded piece of advice from an armchair activist, of something like using Tor at the wrong place and time, it will actually get them – or me – killed. I met, drank, ate, danced and hugged and bonded with people who have been stabbed, had watched their mother raped, even ate human flesh to survive – people who spoke out against beating women, against surveillance, people who escaped dictators only to emerge with a determination to fight back. They are hunted, watched, and they are targets. Anyone who makes a security product with a promise it can’t deliver must know that what they’re doing has real, horrible harm at the other end of it, and they must be made accountable. How did your collaboration with Rift Recon affect your OFF experience? It enriched my experience, without a doubt. I almost always present alone, and in just the session I did with Rift, I realized there’s a lot more everyone can get out of the material when we combine forces, so to speak. Of course, having presented a session and making myself available meant that there were things I had to miss seeing at OFF. This was because I was working one-on-one with people to do risk assessments and needs/action items – as well as just comparing opsec notes among high-risk journalists, which I realized keeps us sane – but I wouldn’t trade it for anything. Getting to speak alongside Rift was incredible, and I also have to add that I was really impressed with my co-presenters. I hadn’t seen them present, though we all collaborated on the material of course, and watching the way they handled on-the-fly issues throughout the session made me really proud that I was up there with them. How do you feel your talk was received? If you could do it again, would you do anything differently? When people come up to you afterward and thank you for making them feel less alone, you know you can sleep that night. It was an honor to have so many amazing people come talk with me afterward, excitedly, and also to be able to share advice with them that I’d learned from working in digitally hostile environments around the world for the past few years. I was really energized when I got to connect with one woman afterward who had amazingly similar opsec practices as I do; you know, it’s such a personal thing, and so unique to every situation and source you deal with. She reports on her investigations tracing terrorist organization funding in a location that’s, at the very least, extremely hostile to women. And we shared opsec practices during and after the presentation; it was incredible! If I could do anything differently, it would be to have more time, and a breakout session afterward – though I had an impromptu one, nevertheless. The attendees and participants needed more one-on-one time, they had a ton of questions that needed answering. I could have done an entire session on risk assessment in the digital reporting environment. It’s needed. What was your favorite part of attending OFF? Violet Blue (@violetblue) is an awarded author, notorious blogger, and independent journalist for CNET, Zero Day, ZDNet, CBS News and other outlets. Blue is a notorious public pundit on privacy activism and bleeding-edge tech culture. She is an educator, speaker, crisis counselor, volunteer NGO trainer: Blue is outspoken and controversial. She lost a domain to Libya, has been yelled at by Steve Jobs, and was the first female podcaster. Ms. Blue is well known for breaking news stories at the intersection of cybercrime and activism, as well as the impact of technology on at-risk populations. She was first to break the stories of Wikipedia’s paid-editing scandal; the hacking of US Government institutions such as The Federal Bank and Federal Sentencing website by Anonymous; the Google “real name” (“nymwars”) debacle; and many more stories. Blue has worked and taught in the healthcare harm reduction sectors for over a decade, and participates as an instructor at the UCSF Global Health Program live simulations, where she works alongside Doctors Without Borders and other NGOs to train on-the-ground crisis workers in circumventing hostile media situations.